Between 2005 and 2014 Labour has seen dwindling support from a wide range of blue-collar working demographic groups. Transient single populations in routine occupations; low income families; comfortably off industrial workers; middle-aged working couples with young children; older couples in former council estates or low value housing. Whilst many retain their loyalty to Labour a sizeable proportion are moving to UKIP. In many constituencies which Labour is targeting in 2015 almost a half of all households are comprised of these groups. Importantly in the current context when these groups are asked whether they are comfortable living in close proximity to people from different cultures and backgrounds they are more likely to say no. For example, in Amber Valley, number 11 on Labour’s list of seats it must win, over 40 per cent of households are classified as belonging to just these blue-collar groups. Little surprise, therefore, that UKIP performed well in the recent local elections there, finishing second in eight wards. 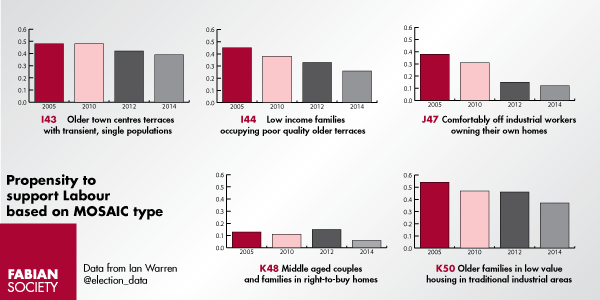 Labour has also, perhaps surprisingly, seen its vote fall amongst the poorest in society since 2005. Childless tenants in social housing; older tenants in low rise social housing; vulnerable young parents in need of substantial state support. In the recent local elections these voters, where they voted at all, voted UKIP in wards up and down the country. These are core Labour voters with repulsion for both the Conservatives and the Liberal Democrats. However they clearly feel left behind and are using UKIP as a means to exercise their anger. When taken together these findings present serious problems for Labour. Large numbers of its own supporters are being drawn to UKIP or are choosing not to vote. There are first- and second- order impacts. In first-order impacts UKIP will compete in seats it feels it has a chance to win, but perhaps more importantly there are dozens of seats where UKIP voters will effectively decide the outcome if their support is maintained. These impacts are context-specific, unprecedented, and throw neatly arranged strategic plans into disarray.